I have a confession. I suffer from Black Ice Phobia. It's a real thing...it's on the internet, ya know :o) Seriously, the thought of driving on icy roads FREAKS me out. Like really freaks me out. I never liked driving on icy roads, but I could deal. And then I had a bad experience on icy roads in college. After that I was always nervous, but I could still drive on the roads...very cautiously. A few years ago, when Hillary Ashton was a baby, we had an accident on the icy roads. That accident catapulted my fear of icy roads to a full blown phobia of icy roads. Sweet boy had to travel out of town this week and I have to admit, Hillary Ashton did not go to school because I could not drive her. It was the first two days she has missed all year. I tried to take her. I didn't make it very far. I saw the ice patches on our road and the highway and that was it...back to the house! Luckily, sweet boy got back last night and took her to school today! Whew! I know my fear is irrational. In my head, I knew that my sweet boy left the day after it snowed, traveled three hours and then also made it home with no problems. I also know that my dad drove two hours up here on Wednesday to bring Sophie Le home and he made it home safely. I know those things...however, I could not drive ten miles down the road to take my child to school. So why am I sharing this crazy piece of me with all of you? Even though my fear may seem crazy to many people, it is not crazy to God. He cares about me. He cares about every detail of my life. Not just the big things...the little things too. How amazing is that? The King of the Universe cares about me and my crazy phobia. Today I HAD to get out of the house. I HAD to go visit a friend, go grocery shopping and I HAD to pick up Hillary Ashton from school. I drove over a bit of ice on our street and then I pulled out on the highway. My palms and feet sweating like crazy. 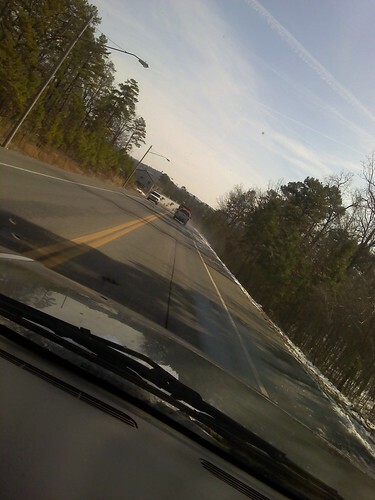 I was sooooo relieved that the truck in front of me was driving slowly (when I tried to get out on Wednesday, everyone was driving normal speeds even though there were ice patches on the road!). I knew there were still a few ice patches on the highway since I made sweet boy give me a full report before I left home. My heart was pounding and my eyes were peeled for ice, but I didn't see any. I was concentrating so hard on the road that it took about three miles before I realized the truck in front of me was SCRAPING all of the remaining ice off of the road! Can you believe that? I was already talking to God non-stop pleading with Him to keep me and my babies safe and that pleading quickly turned to thanks. Even though my fear was crazy, I am so thankful that he sent that ice scraper to lead me into town...scraping the road clear right in front of my path. Wow! I am so thankful to serve such a compassionate God. And I made it! Whoo hoo! The girls (and Jonah) and I went downtown and had lunch with sweet boy and then we stopped by and picked up some flowers and cookies to drop by my friend's house. When Sophie Le asked why we were taking flowers to Ms. R, I told her about how Ms. R was a little sad because baby A left yesterday to go live with her birth dad. We talked again about foster vs. adoption and how adoption is forever and foster is only for a little while. She then grabbed Jonah around the waist and said, "Mama, please don't let A's daddy come get Jonah too." 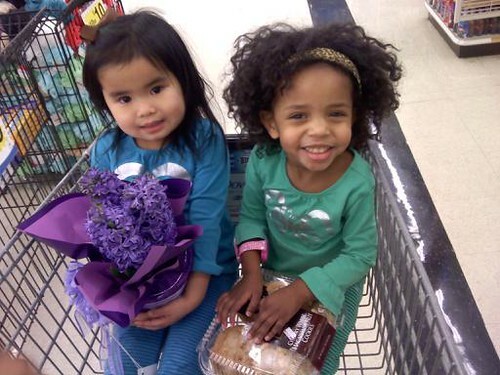 After we picked up Hillary Ashton from school, we went grocery shopping. I hadn't been to the store in a week and a half so we had a lot to get! Poor Julianne's spot in the cart kept getting smaller and smaller :o) Haha! She didn't seem to mind a bit :o) Sweet girl! My big girl had her first fabric department experience today! She looked through the big book of patterns and chose a pattern for American Girl clothes! She also chose a couple fabrics to have cut. She was soo excited! That is so neat, Amy!! Those little reminders of God's love are always awesome! I can't sew with a pattern either, I am so jealous b/c I would love to go to the store and buy an American Girl pattern and fabric. Maybe your photos of her masterpieces will inspire me. My number one anxiety revolves around travel and driving. I LOVED that you shared this story. I needed to read it. Watch out enemy we have a ice truck in front of us! I truly enjoy seeing and reading about your precious family. Ice makes me very nervous too! We have had a lot of it this week, so it has been stressful trying to get out for errands! 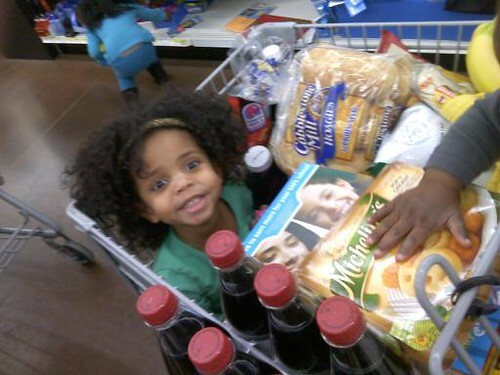 Love the pic of Julianne in the grocery cart. We have had those moments! Now that is just amazing... God seriously had you right behind the ICE SCRAPER! The power of prayer.. he really does hear and care! :) Love that!